I think this article accomplishes a great deal in furthering the conversation of just what actions should be taken in combatting these massive spikes in death of immigrants in the Mediterranean. 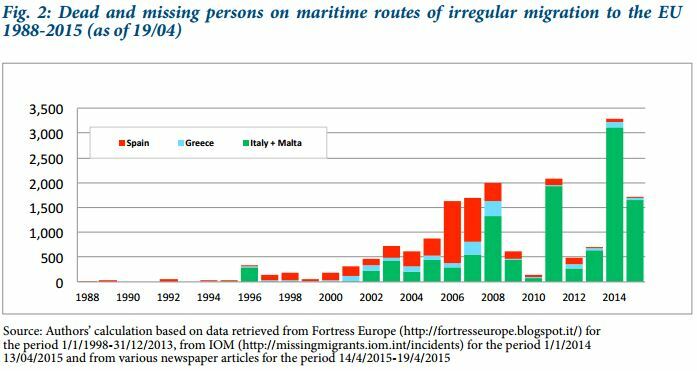 As is emphasized in the above graph, the spike in dead and missing persons on “maritime routes of irregular migration to the EU” is unprecedented. 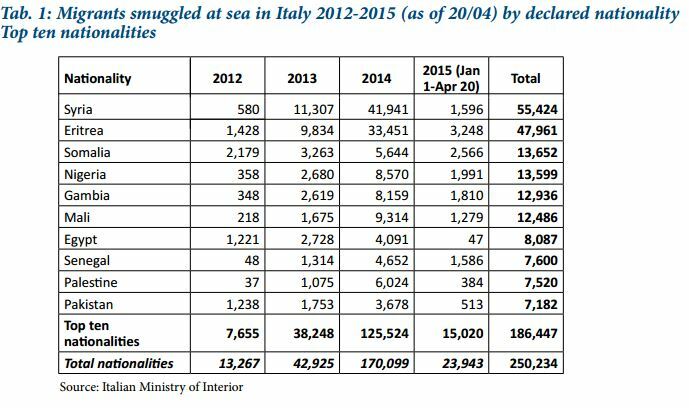 From 1998- 2013, an average 44,000 people were smuggled and recorded annually. In 2014, the number rose to almost 220,000 and in the first three and a half months of 2015, close to 40,000 entries by sea have already been recorded. These numbers have continued to rise, as demonstrated in the estimated 800 people who died off of the coast of Libya a few weeks ago. The article rightfully recognizes the need for the EU to be more ambitious in tackling the issue, not only in the short-term in rescuing migrants, but in curbing the deadly trends that have risen as a whole. I also think it touches upon an issue that can be expanded more upon, mainly that there is a substantial lack of lasting news coverage on the issue. About two weeks ago when I was first reading about the tragedy, the Mediterranean immigration deaths seemed to proliferate all of the major news outlets. Now, a relatively short-time later, looking through BBC, CNN, World News- it is eerie just how much the calamity has fallen out of headlines. Although I understand why the recent Earthquake in Nepal has taken precedence, I still found this to be an interesting consideration in itself because it highlights just how quickly disasters funnel in and out of the news. In many ways, I think that this slows the possibility of instating long-term solutions, especially concerning demographic issues that focus on the volatile actions of people, like immigration, in which desperate people often take desperate actions. During the meeting on the 23rd of April in response to these trends, the European Council committed itself to tripling the budget of the EU sea operations, Triton and Poseidon, from 2.9 to 9 million euros every month. In effect, these funds are ideally supposed to reduce the ability of smugglers to gain access through normal channels of access, but one of the potential issues with this is that it will simply force illegal immigrants and smugglers to begin taking more dangerous routes and methods of transportation. Ultimately, this change may decrease the number of illegal immigrants attempting to cross, but maintain the death rate or death toll due to the adaptably harsher conditions and methods of transportation. This is obviously not an issue that can be solved by throwing money at it. While this is a difficult issue to often discuss in that it is so hard to pinpoint specific solutions, I believe the article raises essential points, but also prompts questions that can further potential resolutions.